Northumberland is one of the largest of the English counties in terms of area size. And it is a deeply rural county. But that doesn’t mean it is accessible only by car. Have a day off from navigating and driving. Prime the iPod, sit back and relax and watch the lovely Northumbrian scenery drift by the bus or train windows. For a starter, try this art trail through the Tyne and Allen Valleys. Important: This timetable is a sample only and was correct at time of going to press. Please check www.traveline.info for up to date and seasonal changes to bus and rail timetables. Here’s why: Haydon Bridge was the birthplace of the English Romantic painter, engraver and illustrator John Martin (1789-1854). Follow the The John Martin Heritage Trial (Two miles). 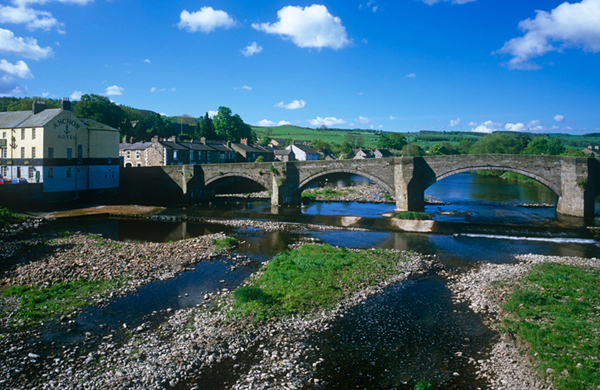 Here’s why: Enjoy a stroll around this historic market town with time to explore Hexham Abbey or The Old Gaol Museum. Here’s why: Allendale Town is rich in the lead mining heritage of the North Pennine hills. There are several cafes in the Market Square and the Allendale Forge Studios offer an opportunity to buy high quality crafts made by local artists. NB: The journey from Haltwhistle to Hexham and reverse (breaking the journey in Haydon Bridge for the John Martin Heritage Trail) can be completed entirely by bus instead of train, if preferred. Haydon Bridge – The John Martin Heritage Trail also offers a longer 10 mile walk into the countryside surrounding Haydon Bridge to discover the places which inspired him as a child. Appropriate outdoor footwear and clothing are strongly advised. Allendale Town – is host to an unusual New Year’s Eve event called the Tar Bar’l Ceremony. Forty five guisers – tar barrel carriers – carry flaming whisky barrels on their heads in procession around the town square. “Be Damned to He Who Throws Last” is their cry as they throw their barrels together to light a bonfire. Haltwhistle Tourist Information Centre is located in the heart of Hadrian's Wall Country, and is ideally placed for information on the local heritage sites as well as the rest of Northumberland. The Centre offers details on transport, accommodation and also sells a range of maps. Community and Visitor Information Point providing information about attractions and tourist accommodation in Northumberland. Information on the history and attractions of the Haydon Bridge area including the John Martin Trail. Internet access/wi-fi. Situated in the heart of the market town of Hexham, Hexham Abbey is one of the most-visited free attractions in the North East and has a new visitor centre, an interactive exhibition, cafe, and shop. Tour the Old Gaol, 1330AD, by glass lift. Meet the gaoler, see a Reiver raid and try on costumes.